The journey through the back roads of South Vietnam and Cambodia, where all your senses will delve deeply into the culture and life style local life along mighty Mekong River. Begin in Saigon, leisurely cycle through the graceful river landscape, pass lush green rice fields, tropical sugar palms and lotus flower dotted lakes. Visit stunning pagodas and converse with monks who share their knowledge of history and culture of these 2 intriguing countries. Get an up-close look into the simple life of the locals and give your taste buds a treat with local dishes. From Ha Tien, we then cycle to the Gulf of Siam with its white sand beaches and gorgeous sunsets. The journey concludes in Siem Reap with the 2 full day discovery tour exploring every corner of the famous Angkor complex. Throughout your journey, we’ve chosen the best accommodations for your comfort and enjoyment. The tour is flexible and may begin in Saigon end in Siem Reap or vice versa. Please contact our travel consultant for more details and promotional offers. 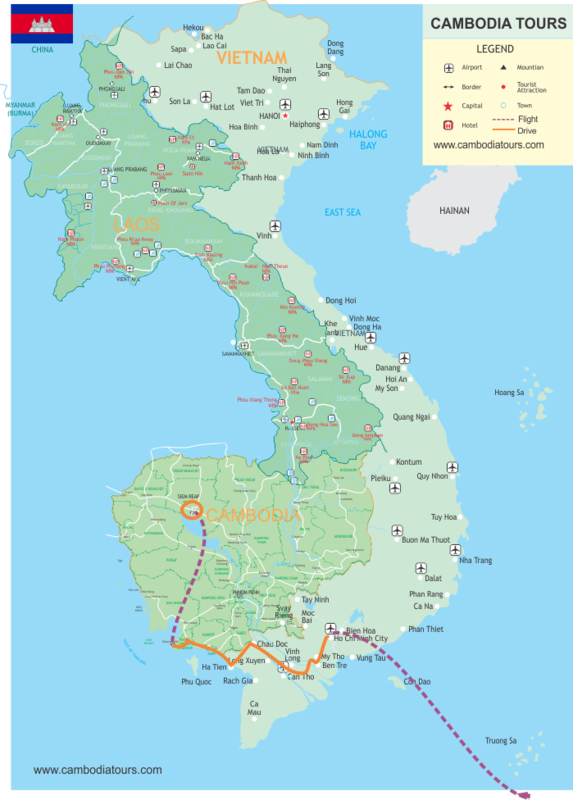 Cities to visit: Saigon, Tra Vinh, Can Tho, Chau Doc, Kep, Sihanouk Ville, Siem Riep - Angkor. Price from: $1677 - Book now! Biking: 50 to 62 km (there are couple options for you to choose from). After noon, we continue the biking heading to Chau Doc. On arrival you could strolling around the town or just relax by hotel‘s pool. After breakfast in the hotel, we leisurely bike along the border of these 2 countries and heading to the sea. After clear the custom at Xa Xia border gate we continue one more hour biking to Kep passing rice field, school along the sugar palm lined paths. We take some short break visit small fishing village, located on the Gulf of Siam. Tonight we stay in an elegant comfortable bungalow seaside resort, so we can jump into the sea and enjoy the colorful sunset. This place is worth for 2 nights stay as it is a jewel on the gulf of Siam. To day, we take the boat trip to the island "Rabbit Iceland", where we spend the day on the sandy beach under palm trees. Enjoy the nature and a freshly well-prepared picnic lunch. The support van will bring you to the foot of Elephant Mountain where we start the biking. The new asphalt road was only the beginning, completed in 2012. Up to the top there is a colonial church and a huge new casino. In the good weather day, the view is spectacular. In the afternoon we bike along the beach passing the coconut forest and Chinese community heading to Sihanouk Ville. Accommodation: Resort in Sihanouk Ville. Day 8 – Sihanouk Ville – Fishing village – Rubber plantation – Water Falls. Today we start early from the start point near the airport, we ride on the path along the white sand beach of "Riviera of the East", founded by Prince Sihanouk in 1965. Wealthy Khmer spent their summer here and now, many travelers from all over the world. Our first stop at the finishing village where you meet, and talk and visit the home of local fishermen, next we ride in to the green of rubber ruber plantation. The trip ends at the waterfall where you could relax and have some light lunch before going back to resort for whole afternoon at the beach. Today after breakfast, we get ready for the short flight to Siem Reap. The home of famous Angkor wat and Angkor Thom. On arrival, our guide and driver will welcome you and take you to Hotel. Later in the afternoon, we take the leisure bike to Angkor Wat or Bakheng for the sunset and get over view of this area. Since 1992, Angkor is a UNESCO World Heritage Site. Surrounded by a lush jungle awaits us a unique temple architecture that deeply impressed us both with their incredible size and extent, but also with its intricate stone carving details. With the bike we ride to the main facilities and visit Angkor Thom, Bayon and of course the towering Angkor Wat. The Srah Srang, the "pool" of the king and, above all, Ta Prohm, the mystical, half sunken in green jungle and overgrown with huge trees. The local guide will take us ride around the ruined temples in the some of the road less travelled and get to know in deep about the great Khmer civilization. This morning, w e leave hotel early and bike pass the jungle heading to the remote area of Angkor complex to the Bantay Srey which was believe was build by females artists. We pass the country side of Khmer people and stop to see how people make sugar and local vodka from “tnoat”- Khmer sugar palm. The trip end with the lunch at the long house of “Bong Thom”in the middle of the organic rice farm. Please be aware that flight time, hotels and all others logistics, services and days of travel are subject to availability. If the listed hotel is fully booked, alternate accommodation will be offered. All hotel ratings are according to the local.